For the off-road vehicle sold as the Dacia Duster in some markets during the 1980s and 1990s, see ARO 10. The Dacia Duster (also the Renault Duster) is a subcompact sport utility vehicle (SUV) produced jointly by the French manufacturer Renault and its Romanian subsidiary Dacia since 2010. It is currently at its second generation, that was launched in the autumn of 2017, and it has also been marketed as the Renault Duster in certain markets, such as India, Iran, Kazakhstan, Russia, Mexico, Egypt, South Africa, Ukraine, the UAE and in South America. Its first generation was also rebadged as the Nissan Terrano in Russia and India. It is the third model of the Dacia brand based on the Logan platform, after the Sandero. A four-door double cab pick-up was launched at the end of 2015 in South America, marketed as the Renault Duster Oroch. The Duster was initially introduced in the ice racing version prepared for the Andros Trophy, presented for the first time on 17 November 2009. The production version was revealed to the media on 8 December 2009, and was subsequently launched at the Geneva Motor Show in March 2010. Based on the B0 platform, the Duster measures 4.31 metres (169.7 in) in length, 1.82 metres (71.7 in) in width and has 210 mm (8.3 in) of ground clearance. Its luggage space has a volume of up to 475 litres (16.8 cu ft), while with the rear benchseat folded and tipped forward, its carrying ability can exceed 1,600 litres (57 cu ft). The Duster is offered with two-wheel drive or four-wheel-drive. The 4x4 variants make use of Nissan's all-wheel drive system, which allows the driver to choose from three different driving modes: Auto, in which the rear-wheel drive is engaged automatically in case the front wheels lose grip, Lock, whereby 50 per cent of torque is consistently fed through the rear axle, and 2WD where the transmission is locked into front-wheel drive for maximum fuel efficiency. In September 2013, the facelifted Dacia Duster was presented at the Frankfurt Motor Show. The exterior received important changes in the front with a new chromed grille and redesigned headlights, restyled roof bars, new 16-inch wheels and modest modifications in the rear. The interior was also renewed, with design and features similar to those introduced the previous year on the new models in the Dacia line-up. A new TCe 125 1.2 liter direct-injection turbo engine was introduced. The Dacia Duster features Bosch 8.1 ABS, as well as electronic brakeforce distribution (EBD) and emergency brake assist (EBA). It also features electronic stability control (ESC) as an option on certain versions, as well as understeer control (CSV) and traction control (ASR). This option also allows torque to be transferred away from a spinning wheel in 4x4 mode to improve traction when diagonal wheel spin occurs. On the passive safety front, the Dacia Duster comes as standard with two front airbags (depending on market) and three-point seat belts with load limiters for the front seats. Depending on version, two lateral head/thorax airbags are fitted in addition to the driver and passenger front airbags to provide additional protection in the case of side impact. The pyrotechnic pretensioners for the front seats (depending on version) complete Dacia Duster's retention system. In 2011, the Duster was tested by the Euro NCAP, receiving a three-star rating. It was awarded 27 points (74%) for the adult occupant protection, 38 points (78%) for the child occupant protection, 10 points (28%) for the pedestrian protection and two points (29%) for the safety assist features. In the latter category, the rating was influenced by the lack of the speed limiter and the fact that the electronic stability control is available only as an option. Dacia Duster is offered in Europe, Turkey, Algeria, Morocco from March 2010, with prices starting from €11,900 (or €10,500 in Romanian domestic market) for the two-wheel drive version, and from €13,900 (or €11,500 in Romanian domestic market) for the 4x4 version. From June 2010, the Duster is also available in Ukraine, Jordan, Syria, Egypt and Lebanon and in some African countries badged as a Renault, while in 2011, it is sold in the Persian Gulf States. In 2014, 40% of the Duster units sold worldwide were badged as Dacia and 60% (70% in 2013) as Renault. In June 2011, Renault revealed the Duster in South America at the Buenos Aires Motor Show. It will be produced at its Curitiba plant in Brazil for distribution in Brazil, Argentina, and Chile, and at the Sofasa plant in Colombia, to be sold in Mexico and Ecuador with marketing planned to start in the last quarter of 2011. The Duster is manufactured at the Avtoframos plant in Moscow, Russia with about 80,000 annual quantities, being available since 1 March 2012 with prices starting from about $14,400 and reaching 200,000 sales in 2.5 years. In June 2015, an updated version of the Duster was launched in Russia with some improved engines and features. The Dacia brand was launched in 2012 in the UK and broke records since then, especially the Duster. The Duster was named "Scottish Car of the year", "SUV of the year" and "Budget car of the year" by the Association of Scottish Motoring Writers. In 2012, the Duster was also introduced in Ireland. Since 2011, the flexi-fuel (ethanol) version is available in several Western European countries, while the Bi-Fuel (LPG) version, an OEM Landi Renzo, is offered in Eastern Europe, Italy, Germany, Spain and the Netherlands. As of January 2013, the Bi-Fuel version is also available in France. The Bi-Fuel (LPG) version has proved to be very popular in Poland. Since the Duster's K4M engine has hydraulic lifters, the LPG version needs no regular valve adjustments. As of 2014, the United Kingdom, Ireland, Belgium and Luxembourg are the only countries in the European Union where the LPG version is not offered by Dacia. The Dacia Duster was launched in the UK in 2012, and has received several awards since, including: 2012 Top Gear Bargain of the Year, 2012 Scottish Car of the Year, and 2014 Carbuyer.co.uk Best Small SUV. The Duster is Dacia's best selling vehicle in the UK, with 20,000 sales as of 2016, from the 70,000 total Dacia sales in the same period. The Duster was introduced in Russia in 2012, as Renault Duster. Its off-road capabilities for the relatively modest price have made Duster very popular. Initial strong demand has caused preorder waiting times of up to 18 months. In the first half of 2013, Renault Duster sold 40710 units, making it the 4th best-selling car model in Russia overall. The Duster is adapted to the Russian consumers expectations with for example the Renault Start innovative system of remote engine start, useful during the cold days to heat the car's body and engine, which decreases polluting emissions. In June 2015, a renewed version of the Duster was launched in Russia with a new range of more powerful and low-consumption engines, an automatic gearbox, some new options, new interior ergonomics and materials of interior trim, and a new exterior design. Renault launched the Duster on 4 July 2012 in India, with various modifications for the Indian market. The suspension and the underside of the car were strengthened to increase the car's offroading suitability. The Duster is currently available in ten different variants, out of which eight are diesel and two are petrol. This version has some additional safety features as standard, including door warning lights, central locking and engine protective underguard. It also comes with safety features like Anti-lock Brake System, Emergency Brake Assist, Electronic Brake-force Distribution, stability control module, two front air-bags and three-point seatbelt tensioners features. Renault India launched the All Wheel Drive (AWD) version of Duster at INR 11.89 lakh. Powering the new Duster AWD is the 1.5-litre diesel engine – which produces 110 bhp, and 248Nm of peak torque – coupled to a six-speed manual transmission. Renault claims a fuel efficiency of 19.72kmpl from this new entrant in the line-up. The all-wheel drive feature of the SUV, can be controlled via a toggle switch, that has three options to choose from – two-wheel drive, automatic, and four-wheel drive which can be manually locked. Renault introduced the Duster in South Africa in October 2013. The Duster was originally imported from India, where it is also produced under the Dacia brand for other right-hand drive markets, namely the United Kingdom, Ireland, Cyprus and Malta. In September 2015, South Africa received the facelifted version of the Duster, with cars being imported from Romania. 1.6 Expression: It equips driver's airbag and front electric windows. It is powered by a 1.6 16 valve, 110 PS engine. Also equips a 5-speed manual gearbox. 2.0 Dynamique: It equips two frontal airbags, rear electric windows, ABS, foglights, leather wheel, electric mirrors and a 6-speed manual gearbox. Also includes GPS system and leather seats as optional. 2.0 AT: It has the same equipment as the Dynamique version. Equipes a 4-speed automatic gearbox. 2.0 Dynamique 4X4: It is equipped the same as the Dynamique version, but includes 4WD system and black background headlights. The Duster is exported from Colombia mostly to countries as Mexico, Ecuador and Bolivia. All versions are powered by a 16 valve, petrol engine. Also, since May 2014 it includes Media Nav system with GPS in Dynamique versions as optional. 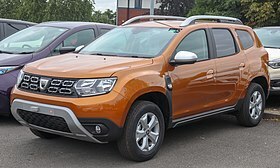 In October 2015, a special edition called "Dacia Duster Connected by Orange" was released, featuring a Wi-Fi hotspot with a two-year free contract from the mobile operator Orange, a rear-view camera, a new brown paint color, a new version of 16-inch rims and electric-heated front seats. The Renault Duster Oroch is a double cab pick-up version of the Duster. The Duster Oroch is the first Renault-badged pick-up and creates a new range in the pick-up market: 30 cm larger than the small ones and smaller than the large pick-up, but yet with 4 real doors instead of 2 or 3 for the usual smaller pick-up. It was unveiled on 18 June 2015 at the Buenos Aires Motor Show and was previewed by a concept car at the 2014 São Paulo Motor Show. The Duster Oroch is available since September 2015 in South America and will get an automatic gearbox in 2016. It is powered by either the 1.6 litre or the 2.0 litre petrol engine, mated to 5-speed or 6-speed gearbox respectively. British motoring journalist Jonny Smith took the Duster on a road test in Morocco for the Fifth Gear TV programme, describing it as "brilliant"; "I really like this". He particularly praised its handling on poorly maintained mountain roads, while commenting on its poor standard of finish. Another drive test in Morocco was performed by James May for the Top Gear magazine. The Dacia Duster was awarded the "Autobest 2011" prize by the members of the Autobest jury, coming from fifteen countries (Bulgaria, Croatia, Czech Republic, Cyprus, Macedonia, Hungary, Poland, Romania, Russia, Serbia, Slovakia, Slovenia, Turkey, Ukraine and Malta). Ten members of the jury have designated the Duster as the winner, after scoring in 13 criteria such as fuel consumption, versatility, roominess or design. It outran the Renault Fluence, placed third. The Dacia Duster was nominated among the finalists of the "2011 European Car of the Year" award. It received praise for being "a real bargain", "a competent off-roader", as well as "attractive" and "practical". The Dacia Duster was named the "Scottish Car of the Year 2012" at a ceremony held in Glasgow on 14 October 2012. It was also named "The Bargain of the Year 2012" by the Top Gear magazine. In India, the Renault Duster received the "2013 Indian Car of the Year" award from a jury comprising leading automotive magazines of the country. A second generation was announced between 14 and 24 September 2017 during Frankfurt Motor Show with actual models reaching the Romanian market six weeks later in November 2017. The new model has nearly the same length and comes with five seats, unlike pre-launch rumors that there will be a seven-seat model available. It is built on the same B0 platform as the first generation. It now features an electric power-steering, a MultiView camera system that is made-up of four cameras, blind spot warning system, automatic climate control, keyless entry and ignition system, and daytime running lights. The ground clearance has been increased and a hill-start assist system is also offered, as well as hill descent control. The interior design has been revamped and the interior noise has been reduced to half from its previous generation. The top trim level features 17-inch (430 mm) wheels. It has a nearly the same boot volume of 445 litres on two-wheel-drive versions, or 376 litres on four-wheel-drive versions, and a total dedicated storage space of 28.6 litres. It retains tweaked versions of the same 1.5-litre diesel, and 1.6 and 1.2 petrol engines as the outgoing model. The diesel can be mated to a dual-clutch automatic transmission (EDC). Although it is near-identical in terms of dimensions, according to the brand's design boss, Laurens van den Acker, every body panel is new. In December 2017, EuroNCAP has published the results for the crash-tests of the second generation model. It received three out of five stars, the result being considered an expected one, although most of its rivals received five stars. It was awarded 27 points (71%) for the adult occupant protection, 32 points (66%) for the child occupant protection, 24 points (56%) for the pedestrian protection and five points (37%) for the safety assist features. In the frontal offset test, the driver received marginal to good protection ratings, while the passenger occupant received adequate to good ratings. In the frontal full width test, the driver's head received a poor protection rating and an adequate to good rating for the rest of the body. Pedestrian protection was "predominantly good or adequate but poor results were recorded along the base of the windscreen and along the stiff windscreen pillars. The bumper provided good protection to pedestrians'legs and protection of the pelvis was also good at all test locations." In terms of safety equipment, it was downrated because of the lack of knee airbags, rear side chest airbags, side pelvis airbags, automatic emergency braking system or lane assist system, but it received points for the availability of the speed limiter and the seat belt reminder. British website carwow has reviewed the car in July 2018. It was criticised for the poor range of equipment in the lowest trim level, considering its price, for its plasticky, dark-coloured and "cheap-feeling" interior, the lack of light for the vanity mirror or the noisy electric motor for the windows. Among the good points there are its accessible folding seats, the rear-view and panoramic cameras, the in-depth-adjustable steering wheel, the good visibility and handling inside town, the soft suspension and the lock mode for the four-wheel-drive. The 1.6-litre petrol engine was considered slow and noisy, and its steering not responsive enough. Overall it was rated as "a good budget buy if you're after something practical and relatively cheap to run", but it was added that "if safety and upmarket features are high on your list of priorities then you might want to look elsewhere". A competition version of the Duster, fitted with a 350 hp (261 kW) V6 petrol engine and driven by Alain Prost, took part in the 2009–2010 edition of the French ice racing championship Andros Trophy, finishing in second place at the end of the season. In 2010, the Duster participated in the Rallye Aicha des Gazelles, being first in the crossover class. The two Dacia teams successfully finished the Rallye on board the Duster: Dounia and Isabelle (Team 315 - Dacia) were first in the general ranking, while Nathalie and Dorothée (Team 316 - Dacia) finished in 5th place (out of 8 teams competing in the class). In 2011, Dacia announced that they would be racing the Duster in the "Unlimited Class" of the Pikes Peak International Hill Climb. The Dacia Duster 'No Limit' was powered by an 850 bhp version of the VR38DETT engine, used in the Nissan GT-R, mated to a six-speed sequential transmission. The car was tuned by Tork Engineering, Sodemo and Renault Sport and was driven by three-time Trophée Andros winner Jean-Phillipe Dayraut. In 2013, two Renault Duster prototypes took part in the Dakar Rally, which took place in Peru, Argentina and Chile. They were powered by 3.5-litre V6 engines, developing over 300 hp (224 kW), and were driven by Emiliano Spataro and José García, with Benjamin Lozada and Javier Mauricio as co-drivers. For the 2015 and 2016 editions of the Dakar Rally the Renault Dusters were significantly changed and now feature a V8 engine (Nissan VK-50), SADEV gearbox, Reiger shock absorbers and Powerbrake 6-piston calipers. Renault Design Central Europe presented, at the 2009 Geneva Motor Show, a concept car named Dacia Duster. This concept vehicle was a 5-door SUV with rear suicide doors for easy access, that addressed the needs of families, with a roomy cabin in a compact package and a large 470 l (124 US gal; 103 imp gal) trunk. The engine emission level was 139 grams of carbon dioxide per kilometer and it had a fuel consumption of 5.3 l/100 km (44 mpg‑US; 53 mpg‑imp). The Dacia Duster was the first concept car developed by Dacia, in collaboration with the Renault Design Technocentre. The Duster normally has four seats but can be converted into a two-seat car, the passenger seat slides under the driver's seat and the right back seat slides under the left back seat freeing an extra room of 2,000 l (71 cu ft) ideal for a bicycle. The Duster concept car had a 1.5-litre inline-four diesel engine, equipped with Bosch Mono-Jetronic fuel injection producing 106 PS (78 kW; 105 hp) at 5400 rpm and 240 N⋅m (177 ft⋅lbf) at 2000 rpm of torque. It was a front-engine, two-wheel-drive or four-wheel-drive vehicle, based on the Nissan B platform. It could accelerate from 0 to 100 km/h (62 mph) in 9.6 seconds. If the model had been produced, its initial price would have been around 15,000 euro (US$18,750). At the 2012 São Paulo Motor Show, Renault presented the DCross Concept, based on the production version of the Renault Duster. It was designed by Renault Design América Latina and was meant to "underline the robustness and all-terrains capability of the Duster". It featured a bright green and matte black paint scheme, a raised ride height, roof racks and a spare tire atop, but no other details were given. Romania has demonstrated a combat version of the Duster, complete with armoring, a winch, and roof-mounted machine gun. In October 2014, a double cab pick-up show car called Duster Oroch was presented by Renault at the São Paulo Motor Show. The concept car takes design clues from the DCross Concept, revealed at the previous edition of the event. Dacia Duster was also the name used to sell the ARO 10 on some markets, such as the United Kingdom, during the 1980s and early 1990s. It was offered in soft-top roadster and 2-door estate variants. ^ "Renault Duster". Renault.com. Retrieved 31 July 2013. ^ "Nissan Terrano 4x4 launched in Russia; might come to India too". CarAndBike. 24 April 2014. Retrieved 17 March 2016. ^ "2013 Nissan Terrano Unveiled In India, Launch In October". Overdrive. 20 August 2013. Retrieved 29 August 2013. ^ "Renault Gandeng Indomobil Jajaki Industri Otomotif di Tanah Air" (in Indonesian). Rajamobil.com. 18 September 2013. Retrieved 23 September 2013. ^ "Renault launches product range for Indonesia at 2013 Jakarta Motor Show". Renault. 19 September 2013. Retrieved 23 September 2013. ^ "OFICIAL: Dacia Duster, prima aparitie a SUV-ului romanesc!". AutoMarket. 17 November 2009. Retrieved 4 August 2013. ^ "OFICIAL: Iata noul Duster, primul SUV Dacia!". AutoMarket. 8 December 2009. Retrieved 4 August 2013. ^ "Dacia Launches its Off-Roader Dacia Duster at 2010 Geneva Motor Show". TheNewsMarket.com. 2 March 2010. Archived from the original on 16 July 2011. Retrieved 2 March 2010. ^ "New Dacia Duster". Carscoop.blogspot.com. 8 December 2009. Retrieved 10 August 2011. ^ "New Dacia Duster. More Duster than ever". Renaut.com. 28 August 2013. Retrieved 3 October 2013. ^ "2014 Dacia Duster furthers our admiration from afar". Autoblog.com. 11 September 2013. Retrieved 3 October 2013. ^ "New Dacia Duster. More Duster than ever". Renault.com. Retrieved 3 October 2013. ^ a b "Dacia Duster". EuroNCAP.com. Retrieved 8 September 2012. ^ a b "2010 Geneva Motor Show - Dacia Duster, the low-emission off-roader from 11,900 euros" (PDF). Renault.com. 2 March 2010. Archived from the original (PDF) on 16 July 2011. Retrieved 2 March 2010. ^ "Dacia Duster (2011)". NetCarShow.com. Retrieved 8 December 2009. ^ "2010 Geneva Auto Show: Dacia Duster". Autoevolution.com. 2 March 2010. ^ "Dacia Duster (2010) first official photos". CarMagazine.co.uk. 8 December 2008. ^ "In 2014, sales of private cars + light commercial vehicles (PC+LCV) by the Renault group increased by 3.2% with 2,712,432". Renault.com. 2015-01-30. Retrieved 2015-01-30. ^ "Nuevo Renault Duster". 16valvulas.com.ar. 16 June 2011. Retrieved 12 July 2011. ^ "Renault Duster". Renault.com. Retrieved 12 July 2011. ^ "Renault объявила цены на кроссовер Duster в России Читайте далее" (in Russian). ВЕДОМОСТИ. 12 September 2011. Retrieved 12 September 2011. ^ "In 2 years and a half in Russia, it was sold 200,000 Renault Duster SUVs". 12 September 2011. ^ "Budget brand Dacia continue to break records thanks to buyers loving the value for money". Daily Records. 1 May 2015. Retrieved 14 October 2015. ^ "Dacia Duster Launched". rev.ie. 16 July 2012. Retrieved 11 February 2015. ^ "Sales of cars and light commercial vehicles in Russia in June 2013". Top Gear. 9 Jan 2013. Retrieved 24 November 2015. ^ "The new Dacia Duster has been named Scottish Car of the Year 2012". Car buyer. 15 October 2012. Retrieved 24 November 2015. ^ "How Many Left UK Duster sales". How Many Left. HowManyLeft.co.uk. Retrieved 10 October 2016. ^ "How Many Left UK Dacia sales". How Many Left. HowManyLeft.co.uk. Retrieved 10 October 2016. ^ "Sales of cars and light commercial vehicles in Russia in June 2013" (PDF). Association of European Businesses. 8 July 2013. Retrieved 3 October 2013. ^ "2015 Renault Duster Receives New Engines in Russia". Auto evolution. 25 June 2015. Retrieved 12 October 2015. ^ "New Renault Duster to go on sale in mid-July". Autostat. 22 June 2015. Retrieved 12 October 2015. ^ "Renault Duster AWD". CarDekho.com. Retrieved 13 November 2014. ^ "Car News - car Reviews - car Videos - Auto Trader South Africa". Retrieved 15 July 2015. ^ "Facelifted Duster busts into SA". Independent Online. 18 August 2015. Retrieved 18 August 2015. ^ "Renault Duster Oroch and Renault Sandero R.S. 2.0: two world premieres at Buenos Aires Motor Show". Renault. 18 June 2015. Retrieved 19 June 2015. ^ a b "Presentation of the Duster Oroch show car in Sao Paulo". Renault. Retrieved 15 July 2015. ^ "Renault's Duster Oroch heralds push into pickups". Automotive News Europe. 19 June 2015. Retrieved 19 June 2015. ^ "Fifth Gear: Dacia Duster is like a bare-knuckle fighting gipsy". Romania-Insider.com. Retrieved 15 July 2015. ^ Johnny Smith (2011-11-25). "Series 20, Episode 6". Fifth Gear. Discovery Channel. ^ "Follow that donkey!". Top Gear. Retrieved 15 July 2015. ^ "Dacia Duster in finala Car Of The Year 2011". Dacia. Retrieved 15 July 2015. ^ "The Nominees 2011 - Car of the year". Retrieved 15 July 2015. ^ Cars UK. "Dacia Duster is Scottish Car of the Year 2012". Cars UK. Retrieved 15 July 2015. ^ "Fleet Directory Website". Retrieved 15 July 2015. ^ Ford, Tom (2012-12-19). "Bargain Car of the Year: Dacia Duster". Top Gear/BBC. Retrieved 2012-12-24. ^ "Dacia Duster gets two more awards in the UK". Inautonews. 14 December 2012. Retrieved 16 December 2012. ^ "Renault Duster SUV is Indian Car of the Year 2013". Rush Lane. 22 December 2012. Retrieved 4 August 2013. ^ "Official Dacia Duster safety rating". EuroNCAP.com. Retrieved 29 July 2018. ^ "A competition version of Dacia Duster to contest the 2009/2010 Trophée Andros in the hands of Alain". DaciaGroup.com. 17 November 2009. Retrieved 9 December 2009. ^ "Alain Prost Drives Dacia Duster to Silver in the Trophee Andros". Autoevolution.com. 2 February 2010. Retrieved 28 March 2010. ^ "Road test a success for Dacia". RallyeAichaDesGazelles.com. 28 March 2010. Retrieved 28 March 2010. ^ "Dacia Duster Pikes Peak racer revealed". TopGear.com. 27 May 2011. Retrieved 27 May 2011. ^ "Dakar 2013: Renault apuesta a que el Duster se clasifique entre los 15 primeros". Cosas de Autos Blog. 18 December 2012. Retrieved 20 December 2012. ^ "El Equipo Dakar". Renaultsport Argentinia. ^ a b c d "Dacia Duster Concept" (in Romanian). ProMotor.ro. 3 March 2009. Retrieved 3 March 2009. ^ a b "Dacia Duster la Salonul auto de la Geneva" (in Romanian). ProTV.ro. 3 March 2009. Retrieved 3 March 2009. ^ a b c "Coupe sau maşină de familie? Dacia Duster, prezentată oficial la Geneva" (in Romanian). Antena3.ro. 2 March 2009. Retrieved 3 March 2009. ^ "Primele poze cu Dacia Duster" (in Romanian). Banknews.ro. 2 March 2009. Retrieved 3 March 2009. ^ "Dacia Duster - crossover coupe concept în premieră la Salonul Auto de la Geneva" (in Romanian). InformatiiAuto.ro. 2 March 2009. Retrieved 3 March 2009. ^ a b "Renault shows DCross Concept in Brazil". Autoblog. 23 October 2012. Retrieved 4 August 2013. ^ "2012 São Paulo Motor Show: Novo Clio, Fluence GT and D-Cross in the spotlight". Renault.com. 22 October 2012. Retrieved 4 August 2013. ^ "Bulletproof Dacia Duster Army Vehicle Is a Budget Humvee-Wannabe". Carscoops. Retrieved 15 July 2015. ^ "DACIA Duster 1.6 4x4 16v road test, review, test drive". Autoevolution.com. 24 June 2010. Retrieved 6 November 2010. Wikimedia Commons has media related to Dacia Duster.